What’s happening at your place? Are you having an extension built? Are you renovating? Is it time for a de-clutter or Spring clean? Are you moving and need to get rid of stuff you’ve collected over many years. Are you selling? 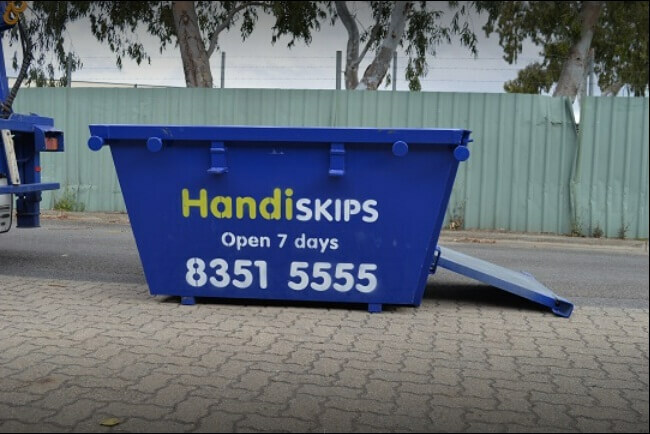 What are Benefits of Hiring Skip Bins in Adelaide? Whatever the reason, hiring a skip bin from HandiSkips has many a benefits. It doesn’t matter if you have a ton of material to move or only a small amount. There is a skip to suit your needs. From 2, 3, 4 and 6 metre bins, there is a skip ready to be delivered to your place at a time that suits you. Handiskips SA has been in business for many years in Adelaide. They are a trusted and expanding company with thousands of satisfied customers. The business is family owned and run and you are treated professionally by their co-operative and friendly staff. It’s easy to make a booking. They are simple to contact and can arrive at a time to suit you. The company is proud to say they recycle some 95% of the waste they collect so you are dealing with a green business which cares about the environment. You want value for your waste collection and having the range of skips, the ability to pay at your place and choose a time or times that suit you are big advantages. The prices are competitive and the service first class. Being open seven days means if you want a weekend delivery then that can easily be arranged. Your convenience is what Handiskips are all about. If you have any questions, their friendly staff is available to char on the phone. There is a heap of information on their web site which can answer most if not all of your questions. It’s handy to know that waste is divided into various groups such as green, general, quarry, renovation and mixed. It can be a saving depending on the type of waste you want removed. And special items too can certainly be removed although there is a small charge for such items as television sets, mattresses, tyres and gas bottles. If in any doubt, give them a ring and all your questions can be answered. Every skip has a ramp and easy access for you to place your waste on board. You make a time for the skip to be collected. If you have an expected delay in filling your skip, a phone call can change your pick-up allowing you to have everything you want removed done without stress. Call Lisa on 8351 5555 for all your rubbish and waste removal needs.